Cradle Scythe The earliest farm tools were simple hand tools. Wooden tools and metal blades attached to wooden handles are typical of such tools. The scythe, hay fork, hay knives, hay rakes, hay hooks, sickles, and corn knife are all examples of such tools used for harvesting. Eventually manually operated machines or those relying on human or animal power were used on farms. A treadmill that was powered by a horse is an example of such a farm tool. Horse drawn rakes (as seen at left hanging in a barn) are another example of manually operated equipment. A tool powered by the farmer himself was a feed chopper. This machine consisted of a narrow shallow box with a knife blade that pivoted and swung through the box filled with grain or hay. The hay or grain was cut that was a few inches over the end of the trough. After the blade was lifted the farmer or operator of the machine would use a long wooden and iron fork to move the feed along the process. This was repeated many times. 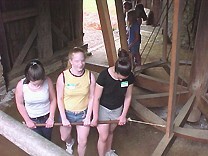 This large wooden wheel is located at Burnside Plantation in Bethlehem, PA. It was recreated to show how a large wheel powered by cattle or horses could be used to run farm machinery. The students pull a bar like a horse would have done in the past. 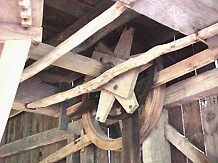 The large wheel turns a drive belt connected to machinery on an upper floor in the barn. Then mechanical power systems were added to the equipment. These tools were powered by gas or oil. Over time these tools became more powerful and could do more work in a shorter amount of time. An antique engine powers the sharpening wheel seen here. It is restored by a member of the Antique Engine Tractor & Toy Club Inc. (Slatington, PA).